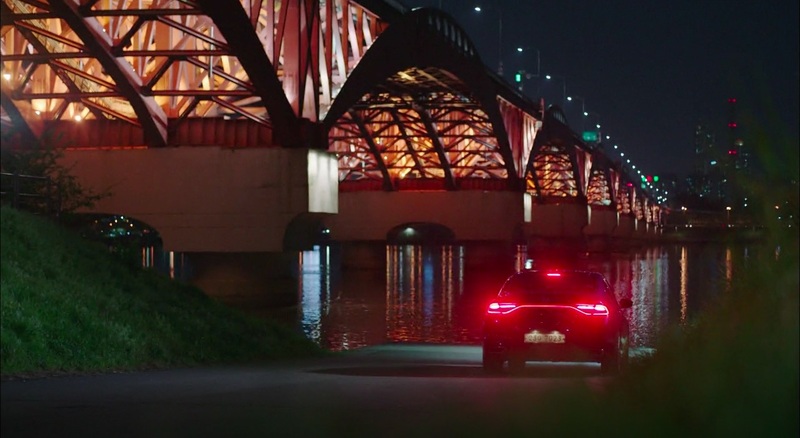 Kim Hae-il (Kim Nam-gil) meets up at this bridge with a former colleague from his National Secret Service times in episode 5 of The Fiery Priest/Hot Blooded Priest (열혈사제) (SBS, 2019). 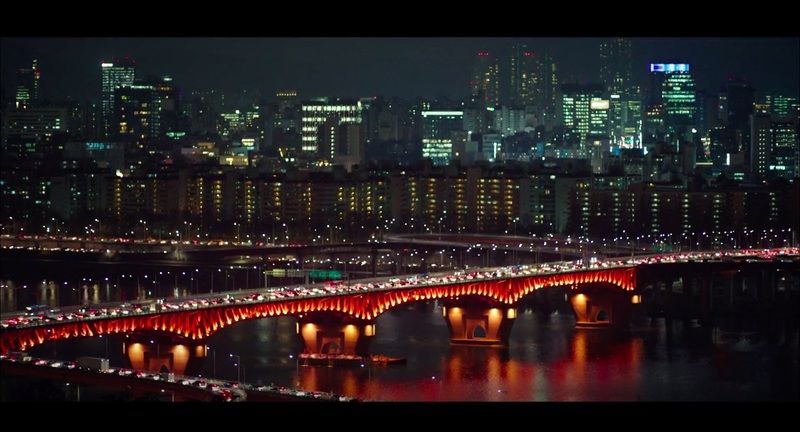 This bridge is featured in the opening scenes of episode 1 of Touch Your Heart/Reach of Sincerity (진심이 닿다) (tvN, 2019). 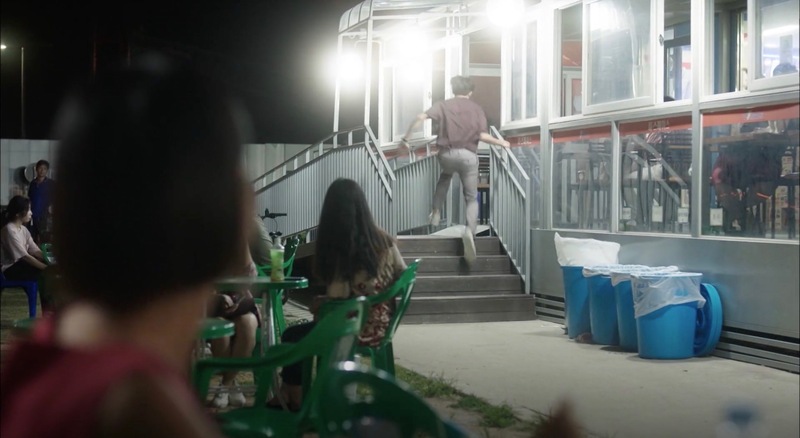 After the specialized squid restaurant where Kwon Jin-kook (Lee Ji-hoon) wants to take Yoon Sang-A (Go Won-hee) on their date is closed that day, she brings him to the 7-Eleven that sits on the feet of this bridge to eat squid ramyun in episode 27 of Your House Helper (당신의 하우스헬퍼) (KBS2, 2018). Jin-kook finally confesses his feelings but it is still not the proposal Sang-a is waiting for. They are back here on a real date in episode 30. 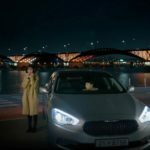 In episode 1 of Jugglers (저글러스) (KBS2, 2017-2018), Jwa Yun-i (Baek Jin-hee) has a date here with her ex-boyfriend Lee Kyung-joon (Sung Joon) and was interrupted by a phone call from her boss. 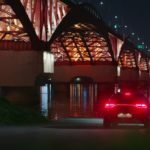 Desperate Seo Tae-soo (Cheon Ho-jin), Seo Ji-an’s (Shin Hye-sun) father, sits at the foot of this bridge, drinking soju, in episode 6 of My Golden Life (황금빛 내 인생) (KBS2, 2017). 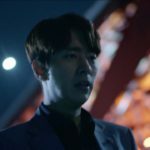 Gods Moo Ra (Krystal) and Bi Ryum (Gong Myung) make a halt here in episode 8 of Bride of the Water God 2017/The Bride of Habaek (하백의 신부 2017) (tvN, 2017), and Bi-Ryum gets a call concerning Hoo Ye (Lim Ju-hwan). 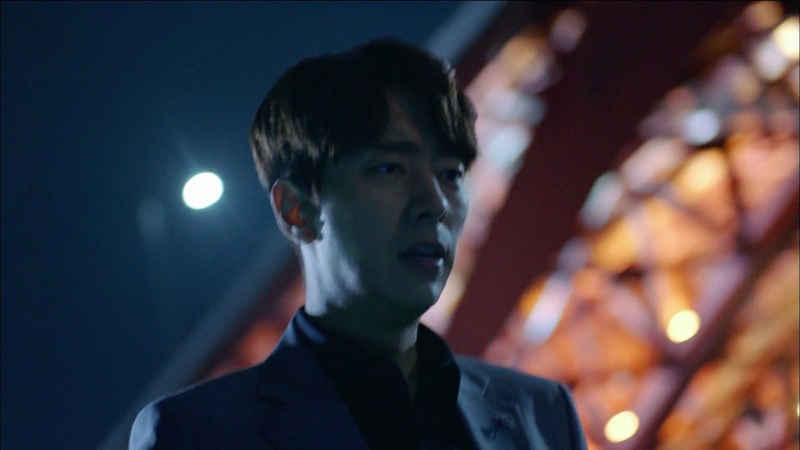 Kim Sun-jae (Yoon Hyun-min) comes here in episode 14 of Tunnel (터널) (OCN, 2017), distraught at the thought that the killer was among them this whole time, and was even someone he looked up to greatly. This agony made him pound his fist into a bloodied pulp on the tarmac. 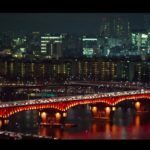 In episode 4 of Night Light (불야성) (MBC, 2016) Seo Yi-kyung (Lee Yo-won) and Lee Se-jin (Uee) go here to talk. 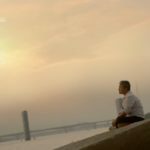 Ahn Dan-tae (Namgoong Min), on the other hand, comes here alone to think things over in episode 9 of Beautiful Gong Shim (미녀 공심이) (SBS, 2016). Jung Joon-hyung (Nam Joo-hyuk) meets up here with his ex-girlfriend Song Shi-ho (Kyung Soo-jin) in episode 3 of Weightlifting Fairy Kim Bok Joo (역도요정 김복주) (MBC, 2016-17). 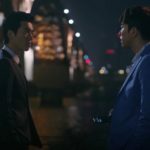 In episode 10, he meets up here with his brother Jung Jae-Yi (Lee Jae-Yoon) to have a heart to heart talk. 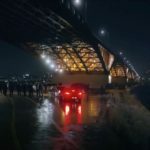 Kim Hyun-soo (Yoon Hyun-min) and Jung Shi-hyun (Jung Kyoung-ho) meet up underneath this bridge in episode 1 of Heartless City/Cruel City (무정도시) (JTBC, 2013) and Hyun-soo tells his partner that ‘Halibut Hyungnim’ was arrested and they need to find a solution. 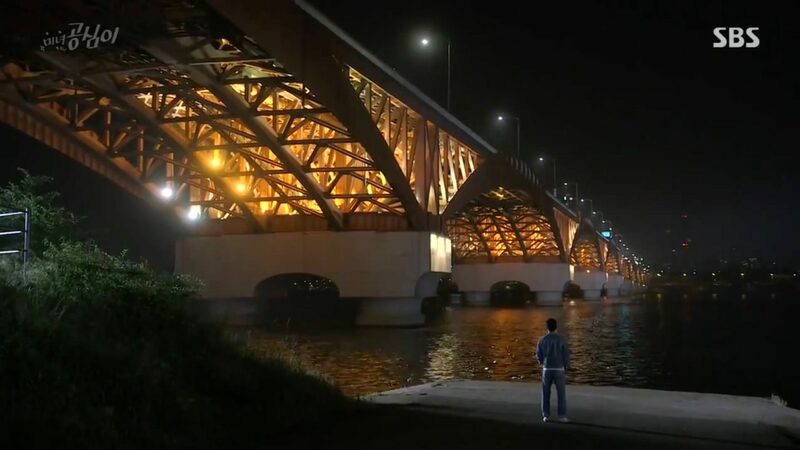 Cha Dong-joo (Kim Jae-won) parks his car close to this bridge at night and listens to Beethoven’s 2nd symphony in episode 14 of Can You Hear My Heart (내 마음이 들리니) (MBC, 2011). Seon Woo-hwan (Lee Seung-gi) consoles Yu Seung-mi (Moon Chae-won) here in episode 9 of Brilliant Legacy/Shining Inheritance (찬란한 유산) (SBS, 2009) after she had a fight with her mother. Kang Seung-jae (Yoon Kye-sang) and Choi Soo-ji (Kim Min-hee) also come here to talk in episode 10 of She Is Nineteen/My Sister-in-Law is 19/My 19 Year Old Sister-in-Law (형수님은 열아홉) (SBS, 2004). She asks him why he loves Han Yoo-Min (Jung Da Bin) so much. Later-on, he has also a heart to heart talk with his brother Kang Min-Jae (Kim Jae-Won) here about his first love — Yoo Min. 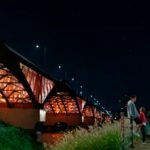 Afterwards they both play basketball on a field just next to the bridge. 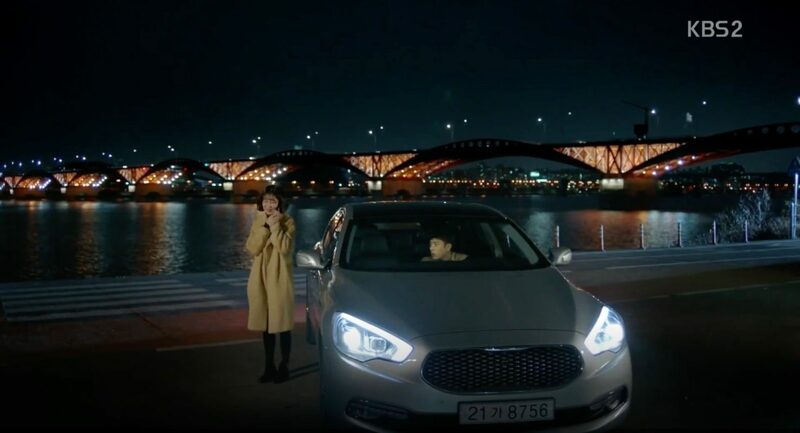 In episode 11, Seung-Jae and Soo-ji come back here for a picnic on their date. Also seen in Rosy Lovers (장미빛 연인들) (MBC, 2014-15, episode 3); High School-Love On/Hi! 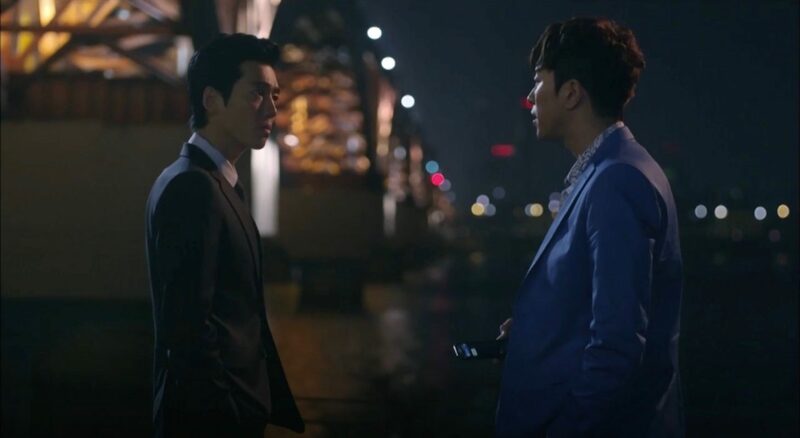 School: Love On (하이스쿨 – 러브온)(KBS2, 2014, episode 1); Wang’s Family / King’s Family/ The Wang Family (왕가네 식구들) (KBS2, 2013-14, episode 37); Rooftop Prince/Attic Prince (옥탑방 왕세자) (SBS, 2012). 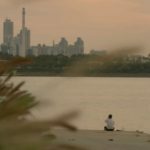 In My Brilliant Life/My Palpitating Life [두근두근내인생] (2014), Choi Mi-ra (Song Hye-kyo), Han Dae-soo (Gang Dong-won) and their son Ah-reum ( ) have chicken and beer for dinner on a field to the left of the bridge. 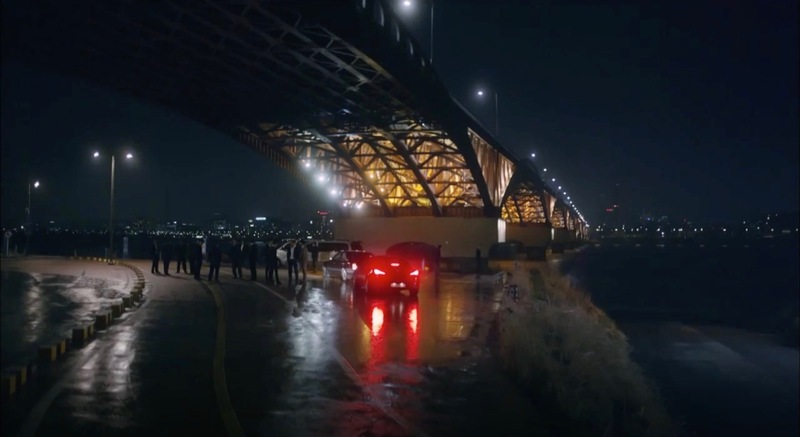 Later, Dae-soo picks a fight under the bridge, with some teenagers who tease Ah-reum for his health condition. 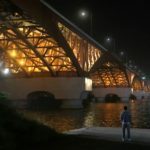 Seongsan Bridge [성산대교] is one of the 27 bridges that cross the Han River in Seoul. 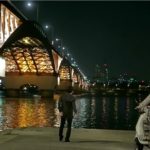 All of the K-Dramaland scenes take place in the Mangwon Hangang Park [망원한강공원], on the North side of the Han River. This park is located in Seoul’s neighborhood of Mangwon-dong [망원동] in the Mapo District [Mapo-gu/마포구].